Editor's Note: Are highways racist? If so, the racist "Plan Bay Area" needs to rethink its policy of infill housing on brownfield sites (toxic waste sites) for affordable housing along the freeway. (aka. "transit oriented development"). I believe that economics and politics are stronger reasons why low income housing is in the "toxic danger zone" than overt racism. It is positively shocking to me and fellow environmentalists, that CEQA is being dismantled to allow developers to build on urban infill sites despite the unsafe environmental hazards. Pregnant women and children are especially susceptible to toxins in our environment. During the first two decades of constructing the Interstate Highway System, almost half a million households were forced to leave their homes. 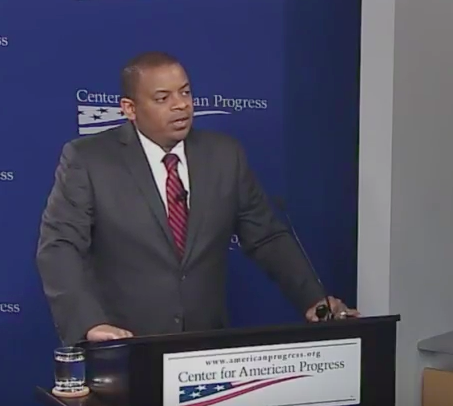 Transportation Secretary Anthony Foxx is offering a surprisingly honest appraisal of America’s history of road construction this week, with a high-profile speaking tour that focuses on the damage that highways caused in black urban neighborhoods. Growing up in Charlotte, Foxx’s own street was walled in by highways, he recalled in a speech today at the Center for American Progress. Building big, grade-separated roads through thickly settled neighborhoods devastated communities, uprooted residents, and cut off the people who remained from the city around them. From I-95 in the Overtown neighborhood in Miami, to the Staten Island Expressway, to I-5 in Seattle, freeways divided and weakened city neighborhoods all over the country. 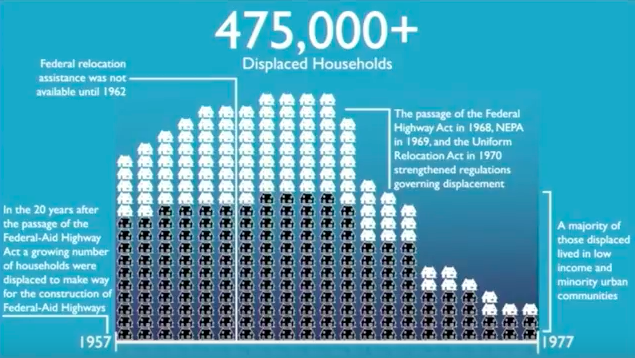 Foxx estimates that nearly 500,000 households were compelled to relocate by the construction of the interstate highway system between 1957 and 1977. Most were people of color living in low-income neighborhoods. “Areas of this country where infrastructure is supposed to connect people, in some places it’s actually constraining them,” he said. The speech marks the launch of a new initiative spearheaded by Foxx called “Ladders of Opportunity,” which aims to shape transportation policy based on how infrastructure can serve as a barrier, or bridge, to jobs, education, and better health. Foxx’s power is limited. U.S. DOT doesn’t have the authority to simply turn off the federal funding spigot for projects like the Detroit region’s $4 billion plan to widen two highways, siphoning resources from struggling inner suburbs to more affluent, farther-flung communities. The transportation secretary can’t wave his hand and stop Colorado Governor John Hickenlooper from pumping more traffic and air pollution through north Denver with the widening of I-70. Of the $60 billion in annual federal funding allocated to surface transportation, 90 percent is doled out to state and local agencies by formula, Foxx noted. The remaining 10 percent funds U.S. DOT operations, discretionary programs like TIGER, and transportation research. Even when U.S. DOT is poised to back a project that aims to benefit a disadvantaged community, local politics often gets in the way. 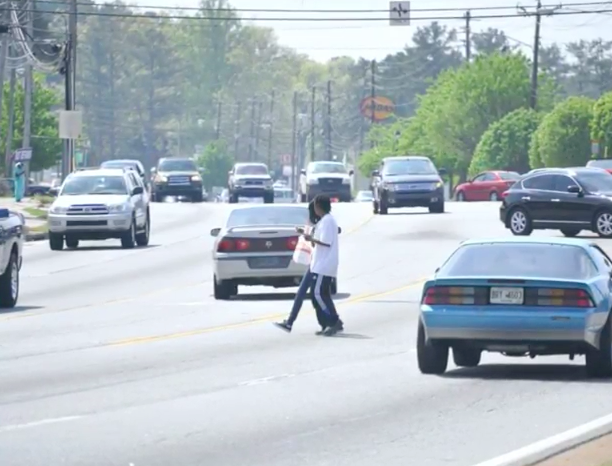 Like many other urban roads, Atlanta’s Buford Highway doesn’t work well for a lot of people who live nearby. Foxx singled out Baltimore’s Red Line light rail project to make his point. “We had planned to commit about $1 billion to this project, only to have it cancelled by the state of Maryland,” he said. The Baltimore NAACP and other groups have filed a civil rights complaint in response to Governor Larry Hogan’s decision to spike the project. That leaves families like Raquel Nelson’s vulnerable. A driver killed Nelson’s 4-year-old son, A.J., while they were trying to cross a hostile road in suburban Atlanta, where crosswalks were few and far between. But it was Nelson who was charged with vehicular homicide. So what can U.S. DOT do? Foxx said the agency is retooling some of its programs to better emphasize social equity. For example, U.S. DOT is making “access to opportunity” a priority when selecting which projects will receive TIGER funding. Foxx also said the agency will beef up its civil rights office, which has the power to shut down projects determined to have a “disparate impact” on disadvantaged groups. Historically, the office has rarely exercised that authority to police the social impact of highway projects. Mostly, however, Foxx’s campaign will have to rely on the power of persuasion. He’s trying to change the hearts and minds of governors, transportation agency chiefs, and other decision makers by raising the profile of issues that transportation secretaries haven’t tackled head-on before. “The question that we have to ask is, ‘What kind of country do we want to build? '” he said.